Titans Return Scourge was not a toy I thought I would be getting � I mean, I bought the previous Generations Scourge (reviewed here by Ganon578) that was released a couple of years ago, and I like that toy a lot. Sure, the first Generations Scourge didn�t quite turn into the same alternate mode that his original, Generation One counterpart did, but it�s a pretty sleek-looking, well-designed toy with a great transformation and an excellent paint scheme. So of course instead of the toys I want (which is honestly nearly every other deluxe class toy in Titans Return) the one that my family bought me for Christmas was the one that I didn�t want. So yeah, I�m a proud owner of a Titans Return Scourge. Putting my cards down right on the table before we start talking about the toy, I still think that it�s a far inferior toy in both looks, functionality, and design to its predecessor, but I�m going to review him as a standalone toy to make this fair. So, yeah, Scourge. In the original toyline, he was introduced as one of the three new Decepticons in the 1986 Movie, created from the corpses of dead Decepticons by Unicron, and generally served as the leader of the Sweeps - basically clones of him that are a lot more disposable than he is. Scourge�s got a pretty memorable design with giant bat wings, a beard and mustache, and well-manicured claw-fingers. In 1987, with the main gimmick of the toy line shifting to Headmasters and Targetmasters (robots whose heads and guns, respectively, that transform into smaller robots), Scourge and his buddy Cyclonus are among those whose toys who were retooled to become Targetmasters. Of course, Titans Return is all about Headmasters, so now Scourge�s partner Fracas doesn�t transform into his gun, but his head. While Scourge�s cartoon and comic design featured those distinctive bat wings, his actual toy didn�t. You could be charitable and call the shell that makes up his Cybertonian hovercraft space bathtub alternate mode as a representation of his wings, but nah. Over the years modern attempts at creating a winged Scourge toy in both the Titanium and Generations line settled in having splayed-out kibble wings to represent his bat wings. The name �Scourge� is so cool that Hasbro has used it several times to represent other villains over the years � first as a toy-exclusive Transmetal 2 locust Predacon in Beast Wars; then as a relatively main villain in Robots in Disguise as an evil counterpart to Optimus Prime; then as the dragon leader of the Jungle Planet in the Cybertron series. 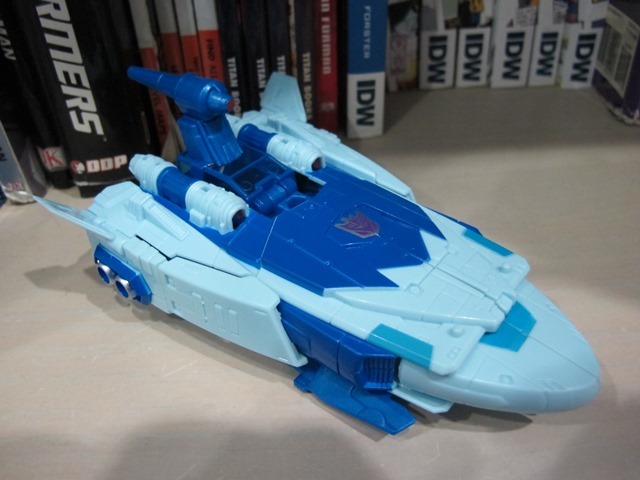 Where the first Generations Scourge updated his alternate mode to a less silly-looking bomber plane, Titans Return Scourge transforms into an updated version of his G1 counterpart�s weird space bathtub-hovercraft-skiff thing. It flies in space! It didn�t have to make sense. 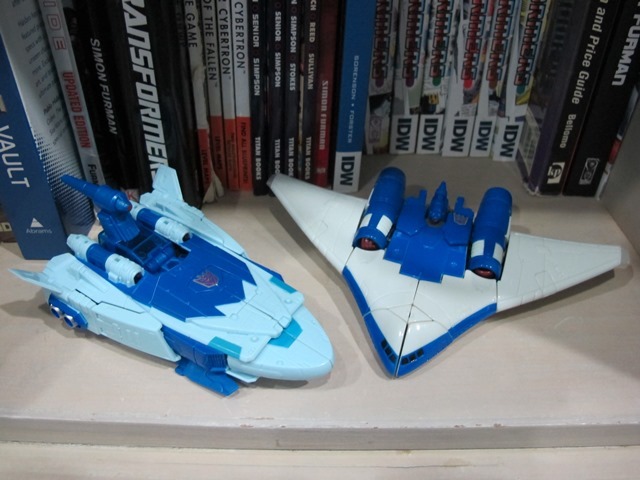 It�s a far more aerodynamic looking thing than his G1 counterpart, though not by much � it�s more angled, and there are more prominent tailfins at the posterior side of the hovercraft mode and the space engines are much more prominent, but it doesn�t quite break the chunky silhouette of the alternate mode. Add that to the problem that Scourge�s legs don�t actually click together properly most of the time � I don�t know if it�s a problem with my particular copy of Scourge, or it�s something common to every single copy of this toy, but it leaves him with an unsightly gap running down his nose almost all the time I try to transform him. 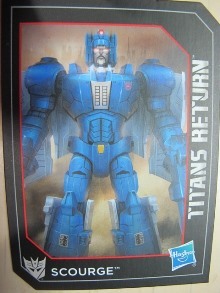 It�s coloured in a reasonably similar paint scheme as the original model, with dark blue and light blue arrayed almost identically as his original toy. The long cyan stripe on the original toy is broken up a little here to simply highlight some details, but it�s an improvement. A Decepticon insignia sits proudly on the center of the hovercraft, and some additional silver paint applications pick out his mechanical detailing. Scourge�s cockpit opens and you can put his buddy Fracas inside. The� weird engine-gun thing on top of his cockpit, that� thingie (it�s hard to describe an utterly bizarre-looking fictional vehicle like this when there aren�t actual terms to call the parts that make it up) can turn around and rotate on its post. You can attach the huge double-barreled gun on the hole on Scourge, and the very obvious chair in the gun can seat Fracas or another Titan Master. It�s a shame, though, that the otherwise perfect-looking silhouette is broken up by flat chunks of kibble (which make up Scourge�s lower legs) that jut out from his underside, and a huge chunk of dark blue break up the supposedly-solid-light-gray-blue parts of his sides. Honestly, it�s a bit of a shame, because these really bring down what is otherwise a pretty solid update to a design that I find ridiculous. Scourge�s robot mode kinda underwhelms me simply because, well, his main body is almost solid dark blue, and that�s a really, really boring design. 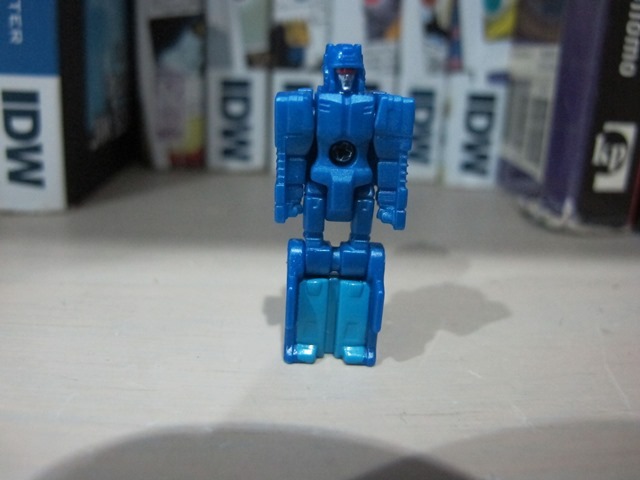 Everything from the top of his head to his toes is cast in a shade of dark blue, and yeah, there are small stickers, silver bits that pick out some detail, but it�s a weak effort and the shade of plastic they used for Scourge isn�t quite as glossy as the stock photographs, making him� a very boring toy. Sure, the �shell� of the vehicle that splays out to pretend to be his bat wings (a laughable attempt, honestly) kind of try and add the light bluish-gray shade that�s supposed to be Scourge�s secondary colour, but it�s nowhere as well-done as it should be. Comparing him to the far more attractive Generations Scourge � both in the shade of blue that the bomber Scourge chooses, and the better distribution of colours � Titans Return Scourge really looks very bland. Oh, sure, arguably TR Scourge is more faithful to the original G1 design, but he�s not an attractive toy. He�s just two colours that don�t contrast with each other well, just huge blocks of boring solid blue. 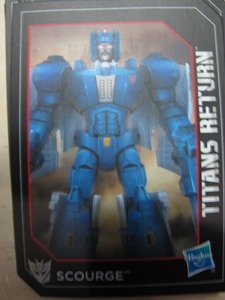 They could've at least made his shins gray or white -- which is what the old Generations toy and the original G1 toy went with -- but no, let's just have solid blue literally from head to toe. The darker blue that makes up a majority of Scourge's body isn't even an attractive shade of blue like Thundercracker, Triggerhappy, or Highbrow. It's just not very nice to look at, and whereas older Scourge toys break the monotony up with whites, grays, and reds, Scourge just has two shades of blue which don't contrast with each other well. Another big problem is his head. The sculpting is perfect, of course, right down to Scourge�s iconic facial hair, but the shape of the head itself? Not so much. See, these Headmasters naturally use shared tooling in order to facilitate compatibility, and they basically swap out parts for the larger robot�s face. Now it�s not a big problem when your head is more or less a generic box with features like Chromedome or Hardhead, but Scourge actually has a distinctive head with a huge� well, thingie on his head. This thing that looks like a hood ornament. TR Scourge keeps this, and it�s actually on a hinged piece� but it�s so small that from the distance you can barely see it. The fact that Scourge�s head is a thick piece of folded robot is far, far more obvious compared to his fellow Titan Masters due to the sheer amount of blue bulk around his face, making him look like he�s hydrocephalic or something. Honestly, it�s partly because they tried to force Scourge�s non-Headmaster-friendly head into transforming, and the result is a badly-realized boxy head. It�s bad enough that Scourge�s head actually looks bad, but it functions poorly as well. It�s apparently a widespread problem that the joint on Scourge where the Titan Master plugs in is very loose, and Scourge�s head just wobbles around. I also own a Highbrow, which is a heavily retooled toy from Scourge, and he�s nowhere that loose. Articulation wise, Scourge sort of disappoints as well. Thanks to how he transforms, he�s lacking a waist joint. His head turns, his shoulders and elbows are jointed, but his wrists are on simple hinges. He�s got articulation on his hips and knees, but his feet are so unstable, and his lower legs are so thick yet hollow, that it�s a bit of a chore trying to pose his legs in anything that�s not a straight standing-up pose. 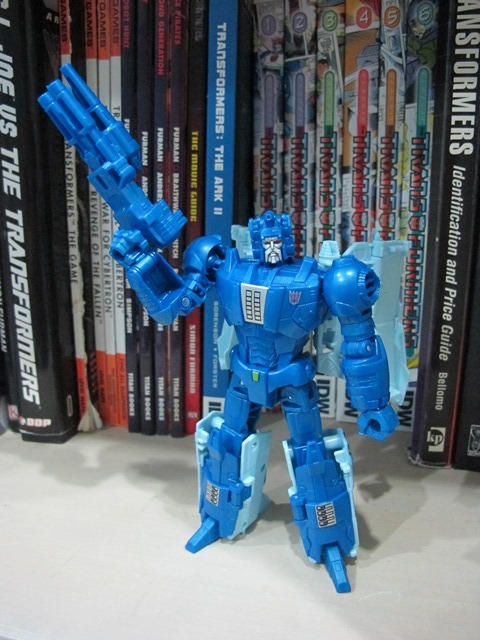 Scourge comes with two guns � one is the huge double-barreled gun with a chair, and the other is the, well, head-ornament-thingie that doesn�t end up on his head thanks to the altered transformation design, but instead acts like a smaller handgun. You can slap it onto the big double-barreled gun to make a triple-barreled gun. Yay? 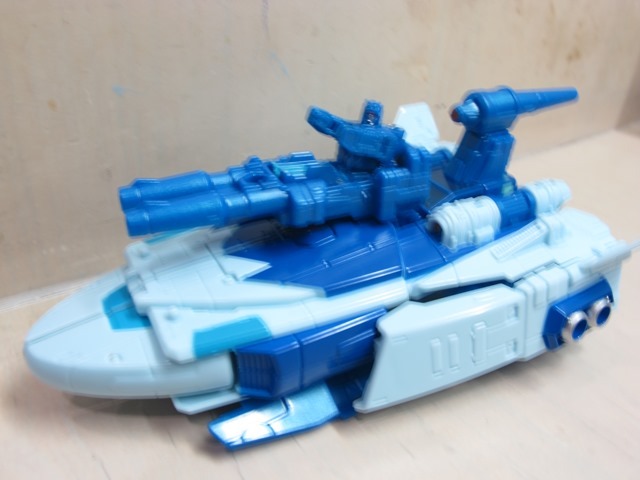 As far as guns go, it�s not the worst I�ve seen on a Transformers toy, but nowhere near the best. I honestly think Scourge�s robot mode is the weaker part of the set, and considering his competition is a freaking space bathtub, it�s saying something. Fracas is actually a decent little bugger, and he�s definitely the most attractive thing in this whole package. His face is painted silver, his visor is red, and his legs are even painted cyan. He functions basically identically to all other Titan Masters, and I don�t feel I have to repeat myself here. Transformation Design: 6/10 A decent effort. It�s a simple transformation, basically the alternate mode opens up to reveal the robot kibble folded underneath. I think his retool buddy Highbrow makes use of the mould�s engineering into a far better transformation, though. And honestly, Scourge really could�ve stood to have far, far better leg transformation. Durability: 8/10 Other than the wobbly head, I don�t think anything on Scourge feels especially fragile. He seems to be made out of the standard good-quality plastic as most of the other Titans Master toys. You can lose Fracas, I guess, far likelier due to it not staying attached to Scourge very well. Aesthetics: 2/10 Yeah, Scourge�s pretty bad. His stock photography makes him look boring enough, but the toy takes it even worse by choosing two far worse-looking shades of blue. His robot mode is almost entirely monochromatic, and none of the things that make Scourge, well, Scourge are really highlighted well. His alternate mode is somewhat better, which is really the only source of points in this category. Articulation: 3/10 He�s got less joints than the standard deluxe class toy, and even then his legs are poorly designed so he can�t really pull a lot of poses off. His head is also very wobbly, which makes it somewhat difficult to pose. Fun: 3/10 It�s a boring-looking robot with bad articulation. The Titan Master interactivity is also especially boring here, just an uninspired �sit in the cockpit� and �sit in a gun�. Price/Value: 2/10 Jeez, there are a lot of better Titans Return toys you can get for your money. 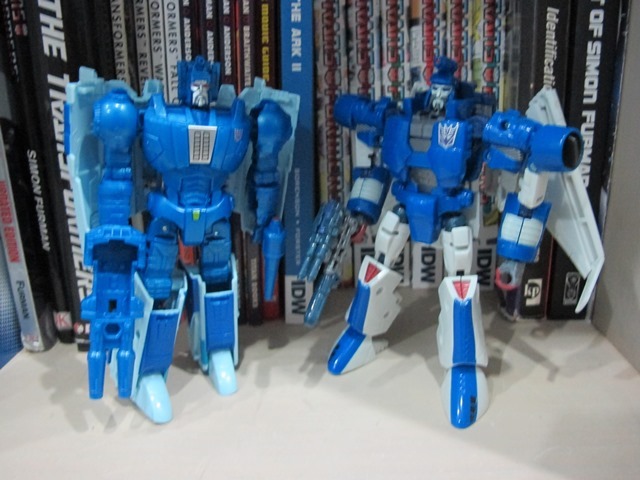 I mean, other Titans Return toys come with paint, not just two shades of blue. Go get Hardhead or Brainstorm or Weirdwolf or something that�s actually well designed. I guess you can wait for half a year or so until all the unwanted Scourges are on clearance and you can build a cheap, ugly, monochromatic Sweep army? Overall: 2/10 Easily one of the weakest toys I own. It�s very boring and bland, has lots of problems, has poor articulation, a relatively poor attempt at a homage, and to top it off? It�s such a huge step backwards from Generations Scourge, a toy that precedes it by nearly half a decade, that it�s laughable that the same team responsible for gems like Hardhead, Mindwipe and Triggerhappy are also responsible for this embarrassment. So much is wrong with him -- he looks terrible, he's got poor quality control, his transformation is barely serviceable, he's not articulated well... nope, not a toy that I'm a big fan of. Go hunt down the old Generations Scourge. A far, far superior toy to this sorry excuse.